Then before we knew it, you guys were pulling up, with Lois right behind and getting situated and the food was getting set out ... it was a lot of fun ... a really fun way to celebrate the end of Frank's campaign, and to watch the election returns come in together. It was really neat to have over Lois and Alicia, Carol Swann, Bob, Eric and Carol and Stephanie and Egon from next door ...the food was amazing, and then the desserts, the cupcakes!! It was amazing to see the reactions of people to Obama's victory ... how much hope it gave everyone, very moving! Corey ran down plates of food and desserts to Betty & Joe, and she was delighted! And then we took food down to Bill, who we knew appreciated it a lot. The crowd thinned out, and soon it was just us, and we cleaned up, packed food away, kept the election coverage going ... talking about the night ... the farts started appearing! Corey and Alexi went off to vote!! I finished with the balloons and then did the flower arrangement and set up all the plates and silverware and then washed carrots and cut them up for roasting! All the cooking was starting and Alexi fired up the grill!! Soon we were on our way to the polls to vote. 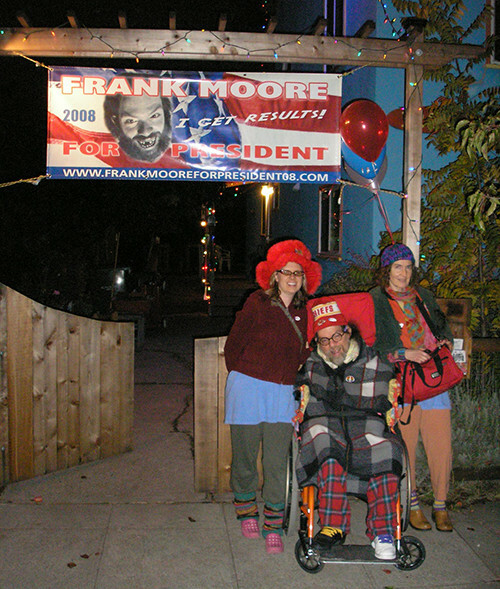 It was a fun walk and quick when we got there voting for Frank, what fun!!! Then we headed down for the event!!! After a couple of trips for Frank's cups and pillows he got settled in his chair and the TV and computer had election news coming to us!! Everything looked great, all the decorating, the flowers and the balloons and all the yummy food!! Louis and her daughter arrived when we did and later Carol Swan and Bob, and our neighbors from next door. It was small and intimate and cozy. We talked and watched the election news and soon ate some of the delicious food, then before we knew it they were announcing that Obama had won so we all gathered in close and watched on TV!! Wow, so many crowds of people gathered around the country and the world with tears in their eyes, amazing!! Carol and Eric arrived with cupcakes just as we were eating our macaroons and cookies, yum!!! They both had some big plates of food and thought the food was great!!! It was fun to meet them. We took food down to Betty and Joe and to Bill, and Betty called to say that it was delicious and that Frank should have won!! Soon people started heading out and we started to clean up and still watching the news coming in and gathering up our asses to head down to the PH. Peeked outside to see if anyone was coming and there you were taking photos of the pretty lights and the awesome banner. Lois and her daughter came in with you as we were just starting to put the food on the island. Was really cool to finally meet Lois. Then Carol Swan came and she was really fun! Bob called and had traveled along San Pablo to Gilman and up to Santa Fe, so I gave him directions to get here. He called again when he got to Curtis so I went out to meet him down the street. When we walked up to the house the lights and everything looked so amazing! It was fun to have him come. There was so much food for everyone. We were all cozy watching the votes come in. It was such a quick success for Obama! Exciting! We heard a little parade going on outside and went out to see it. The people all stopped in front of the house beating and whooping, and they looked up at Frank's banner with curiosity and some confusion and then they moved on. Bob was getting ready to leave so I told him that I would walk him home. I would take my bike so that I could just ride back. He said that it wasn't necessary to do that, he would be ok. I walked him outside and he said he was really glad he came. Said that there would be a lot of people around so he felt better about going home on his own. I opened the gate for him and he zoomed away. Shortly after that the doorbell rang and there was Eric and Carol! And cupcakes! Eric had told me he was going to be baking them for the party as he had a craving to make them and hasn't in a while. They came in and saw the spread and dug right in. Loved the food! Even took a plate for their son and for Mike who works at Phoenix. Corey and Alexi also took plates to Betty and Joe, and Bill. Really great to be able to share the bounty. We all watched Obama's victory speech. Amazing to see a black family up there, and they looked close and warm with each other. Then Carol and Eric left saying they would see me tomorrow. Took me a while to remember what day it was. Then Carol Swan left too with plans to have her mom on Frank's Shaman's Den. We hung out together as the food was divvied up and put away. Cookie was very attracted to Frank and kept lying on his foot. When everything was ready we all walked down to the ph.